Students from the University of Melbourne ran a Teddy Bear Hospital and conducted health checks for children and their parents at Derrimut Primary School on Friday 26 May as part of the Building Healthy Communities in Melbourne’s West project. The project was established four years ago by Western Melbourne Regional Development Australia (WMRDA) after medical students based at the University’s Western Clinical School carried out health screenings in the local community and identified the need for health education and early intervention. Funded by the North Western Melbourne Primary Health Network (NWMPHN), the project is directed by a steering committee chaired by Bill Noonan OAM with representatives from the University of Melbourne, the WMRDA, Brimbank City Council and Victoria Police. Over 2000 screenings have been carried out in the four years. “Risk factors for chronic diseases, such as cardiovascular disease, diabetes, and mental illness, are above the national average in Melbourne’s west. Early intervention projects like this allow us to engage with local families to improve their health and wellbeing,” Mr Noonan says. 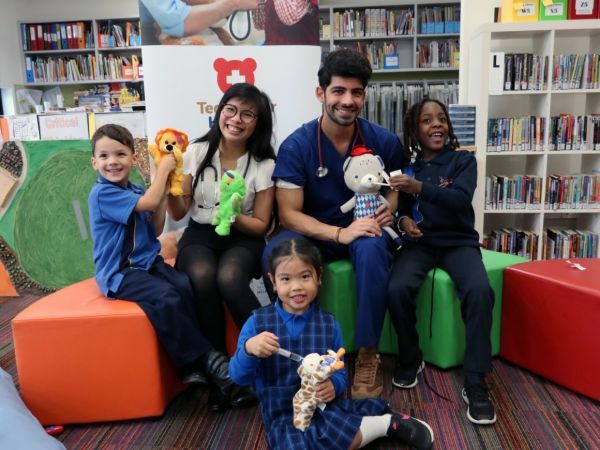 Medicine, dentistry and optometry students from the University of Melbourne ran the Teddy Bear Hospital, engaged children in other fun activities aimed at improving health and wellbeing, and carried out health screenings. Associate Professor Stephen Lew from the Western Clinical School says that students find the project very rewarding. “As well as being hugely enjoyable, our students get a greater understanding of health issues in the community and how to build trust and rapport with children and adults from diverse cultural backgrounds,” Associate Professor Lew says. The event also featured the Victoria Police Band and stalls from community organisations including IPC Health and the YMCA. The funding, design, and construction of a purpose-built sensory garden for the school’s prep children was also announced. Gabrielle Williams – Parliamentary Secretary for Health, Carers and Volunteers – officially opened proceedings. Mayor of Brimbank Cr John Hedditch and NWMPHN CEO Chris Carter also spoke.